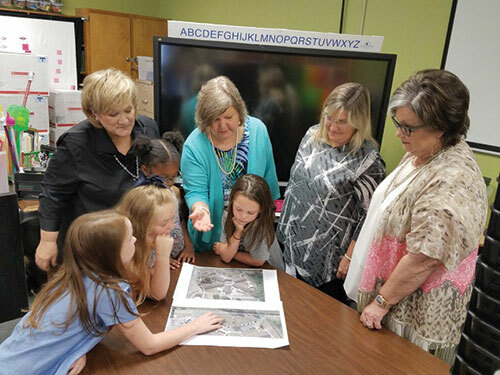 Architect Andrea Harbison and Hamilton Elementary School Principal Lynda Hall share preliminary plans for the school’s coming Alabama Heritage Garden with HES students and booster club members. Pictured are (from left): Leida Kay Bartlett, Gretchen Surman, Aja Thomas, HES Booster Melissa Hughey, Hall, Molly Sandlin, Harbison and HES Booster Paula Wood. MONTGOMERY - Gov. Kay Ivey announced 200 state schools as official Bicentennial Schools, including Hamilton Elementary School, Phillips Elementary School, Winfield Elementary School, Winfield Middle School and Winfield City High School. Launched by Ivey in December 2017, the Alabama Bicentennial Schools Initiative encourages all public, private, and homeschool students and teachers to participate in the celebration of Alabama’s 200th anniversary of statehood in 2019.